Ian Poulter is one of the best putters in the world. Look no further than the 2012 Ryder Cup as an example. Even though you may not roll the rock like Poults, you can protect your putter with the same cover he’ll be using at the year’s second major championship (and maybe just a little bit of that Ryder Cup magic will rub off). 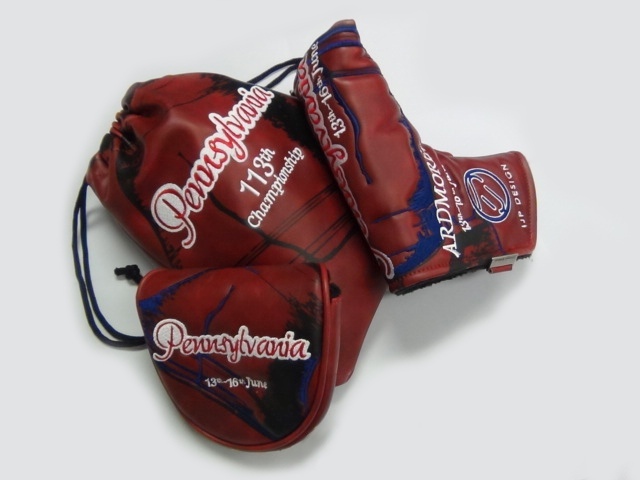 The Liberty Bell Putter Cover from IJP Design captures the historic flavor of U.S. Open host course, Merion, and the Philadelphia area. Since Merion opened in 1910, the pins have been topped with red wicker baskets instead of flags. This iconic red coupled with a rustic leatherette material creates a vintage look and feel for the backdrop of the cover. From there, an outline of the famous liberty bell along with red, white and blue text commemorating the location and date of the tournament are stitched into the cover. This limited edition putter cover is made from PU/leatherette with a soft fleecy lining to keep your putter looking its’ best. An IJP Design ball marker is included along with a protective, lined tote bag that can serve as a valuables pouch, or a stylish place to keep tees and balls. Whether you are looking for a special Father’s Day gift or just a way to commemorate the 113th U.S. Open, these unique putter covers will do the trick. Keep in mind, this is a limited edition item. Only 600 have been made (350 in a blade model and 250 in a mallet design)–each sequentially numbered–so get them before they are gone. You can pre-order them now for $69.95 from the IJP Design U.S. online store at ijpusa.com.